Created as a "collector card" giveaway for participants in the 2nd Annual BootaTown celebration at Adepticon 2012. This one is in honor of "Brother Grimm" on the Freeboota forums. Grimm's one of our moderators hailing from England. 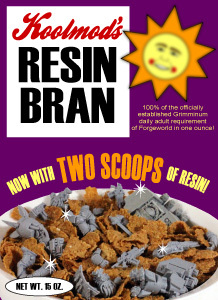 His ForgeWorld resin addiction is the stuff of legend, making his cereal box a no brainer. However, finding pics of him online without a forced blur or pixelation is extremely rare due to his job, but the face on the sun is modeled off an unaltered pic I managed to scrounge up.